Schreier, G., Ammenwerth, E., Hörbst, A., Hayn, D.
Progress in medicine has traditionally relied heavily on classical research pathways involving randomized clinical trials (RCTs) to establish reliable evidence for any given therapeutic intervention. However, not only are RCTs lengthy and expensive, they have a number of other disadvantages, including the fact that they are currently failing to keep pace with the number of potential innovative treatment options being developed, particularly in areas such as rare diseases. With the vast amount of data increasingly available for use in profiling patient characteristics and establishing correlations between outcomes and potential predictors, predictive modeling may offer a potential solution to the limitations of RCTs. 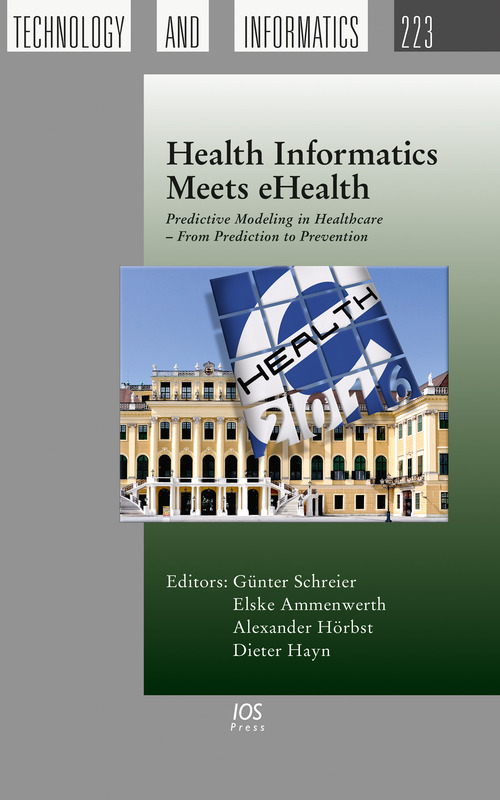 This book presents the proceedings of the 2016 Health Informatics meets eHealth conference, held in Vienna, Austria in May 2016. The conference provides a platform for researchers, practitioners, decision makers and vendors to discuss innovative health informatics and eHealth solutions with a view to improving the quality, efficacy and efficiency of healthcare. The theme of the conference is Predictive Modeling in Healthcare. Covering subjects as diverse as fall-detection in the elderly, diabetes, physiotherapy and pediatric oncology, this book will be of interest to all those working in the field of (e)healthcare and its delivery.